Grilled Pizza Dough Recipe - A summer time must! This quick and mess-free grilled pizza dough recipe is a great way to spend a spring, summer or fall night outdoors. Even better, when the garden starts to produce – you can make endless varieties of vegetable pizzas to satisfy any taste buds. It also makes for a great “make your own pizza pie night” party among family and friends! The biggest fear to overcome is to throw that dough on those grilling grates for the first time. You always expect it to stick – but if you follow this simple recipe – it will turn out perfect every time! The best part of all is the use of only 6 simple ingredients, a large bowl, a measuring cup and cutting board. It makes for any easy night of clean-up! 4 cups all-purpose flour – A lot of pizza recipes call for bread flour – and that is fine – it will give more of a crisp crust – however, we just like the ease of rolling out the all-purpose flour – and like the thicker, chewier crust of the all-purpose flour. Chef’s choice! First, pour one and a half cups of your favorite beer (you can use water – we just like the taste the beer gives to the dough). Warm in the microwave to about 105 to 110 degrees farenheit. Pour in yeast, and let stand for 10 minutes to activate. While the yeast is starting – grease the large bowl with a thin coat of olive oil – then add the flour, sugar, salt, garlic salt and hot pepper flakes in the large bowl. Then slowly add the yeast mixture to the dough – kneading and combining until the mixture forms into a dough ball. If it still a little wet – add a little more of the extra flour mix to it – if it’s a little dry – add a little more water or beer. rise for an hour. Once finished – knead down one final time on a floured board – and cut into four equal pieces – then roll into four equal dough balls. Cover the dough with a towel and let rest about 5 or 10 minutes. Then simply take out each dough ball and roll out. We don’t worry about perfect symmetrical circles – in fact –we let the dough determine its own shape for that authentic Italian look – rolling it out any which way until it’s to your desired thickness. (our’s usually turn out to be about 10″ x 8″ with uneven edges. 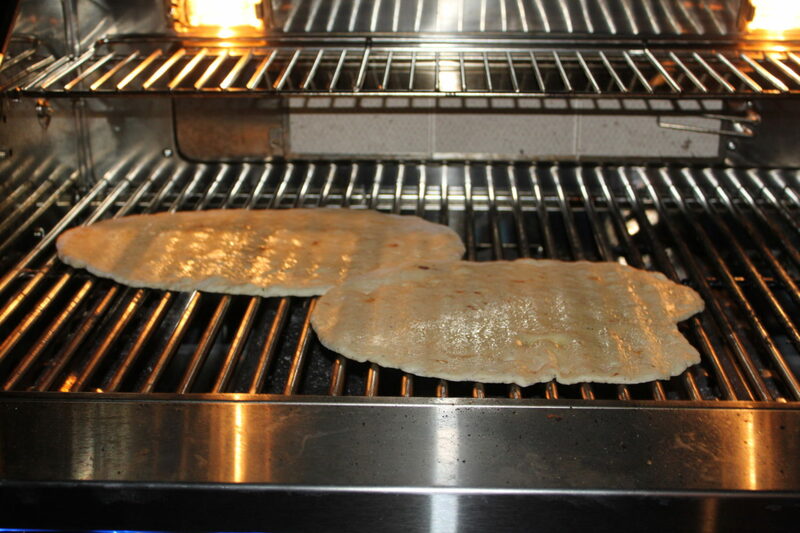 Then we simply drizzle a little olive oil onto each side – and gently rub it into the dough – it’s ready for the grill! Have your grill hot – in the 350 to 375 range – and make sure you give the grates a quick brush cleaning so they are fairly clean. I even will sometimes brush a quick coat of olive oil on the grates with an old grill brush. Then simply lay out the dough on the hot grill grates and let it on for at least five minutes..and no, it really won’t stick! Don’t touch it for the first few minutes– let the oil do its job and in a few minutes using tongs or a spatula – lift up the edges and see if it’s got those nice grill marks. Let it finish off to your liking. Here is where you can go two different ways with your pizza. If you want a truly rustic pizza – take the pizza off the grill and add your pizza sauce, cheese and all toppings to the hot just grilled side – then put the uncooked side back down and finish it all up on the grill. Sometimes, we will go ahead and lightly grill each side at the grill – and then bring in and finish with our sauce – cheese and toppings, and finish in the oven until done. Either way is delicious – and a great way to enjoy an easy grilled pizza! The best part – it’s an easy clean-up. You wash out the bowl, the measuring cup and wipe off your board and you are done! 4 cups all-purpose flour – A lot of pizza recipes call for bread flour – and that is fine – it will give more of a crisp crust – however we just like the ease of rolling out the all-purpose flour – and like the thicker, chewier crust of the all-purpose flour. Chef’s choice! First, pour one and a half cups of your favorite beer (you can use water - we just like the taste the beer gives to the dough). Warm in the microwave to about 105 to 110 degrees farenheit. Pour in yeast, and let stand for 10 minutes to activate. While the yeast is starting - grease the large bowl with a thin coat of olive oil – then add the flour, sugar, salt, garlic salt and hot pepper flakes in the large bowl. Then slowly add the yeast mixture to the dough – kneading and combining until the mixture forms into a dough ball. If it still a little wet – add a little more of the extra flour mix to it – if it’s a little dry – add a little more water or beer. Form into a ball and rub olive oil over the dough ball's outer skin.– place back in the bowl and cover with a towel and let the dough rise for an hour. Once finished – knead down one final time on a floured board – and cut into four equal pieces - then roll into four equal dough balls. Cover the dough with a towel and let rest about 5 or 10 minutes. Then simply take out each dough ball and roll out. We don't worry about perfect symmetrical circles – in fact –we let the dough determine its own shape for that authentic Italian look – rolling it out any which way until it’s to your desired thickness. (our's usually turn out to be about 10" x 8" with uneven edges. 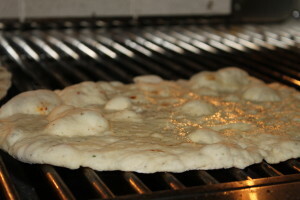 Then we simply drizzle a little olive oil onto each side – and gently rub it into the dough – it’s ready for the grill! Have your grill hot – in the 350 to 375 range - and make sure you give the grates a quick brush cleaning so they are fairly clean. I even will sometimes brush a quick coat of olive oil on the grates with an old grill brush. Then simply lay out the dough on the hot grill grates and let it on for at least five minutes..and no, it really won’t stick! Don't touch it for the first few minutes– let the oil do its job and in a few minutes using tongs or a spatula – lift up the edges and see if it’s got those nice grill marks. Let it finish off to your liking. Here is where you can go two different ways with your pizza. 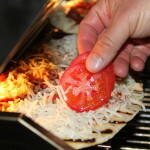 If you want a truly rustic pizza – take the pizza off the grill and add your pizza sauce, cheese and all toppings to the hot just grilled side - then put the uncooked side back down and finish it all up on the grill OR….. Sometimes, we will go ahead and lightly grill each side at the grill – and then bring in and finish with our sauce – cheese and toppings, and finish in the oven until done. Either way is delicious - and a great way to enjoy an easy grilled pizza! The best part – it’s an easy clean-up. You wash out the bowl, the measuring cup and wipe off your board and you are done!